Republic Broadcasting Network » Is Donald Trump a Jacksonian? Is President Trump a “Jacksonian”? He apparently believes so: On his fifth day in office he installed a portrait of President Andrew Jackson in the Oval Office, and he recently visited the last resting place of his presidential predecessor in Nashville. 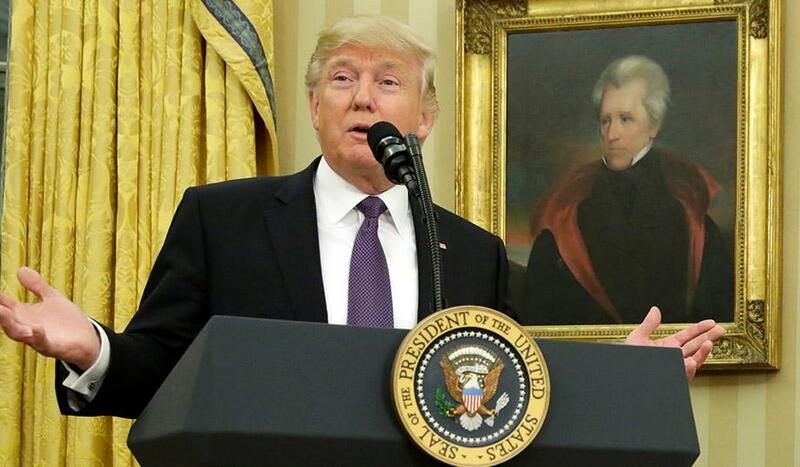 His top political strategist, Steve Bannon, has said that the president likes to compare the populist movement behind him to a similar movement that supported Andrew Jackson and which infuriated the entrenched elites of his day. And infuriate he did. Court historians and other propagandists for the state and state power have long portrayed Andrew Jackson as a country bumpkin, an ignoramus, a tool of corrupt bankers, and worse. The ultimate Ivy League snob, Arthur Schlesinger, Jr., was especially disdainful of Jackson in his writings. Based on this fact alone, you know the man must have been one of the better presidents. Murray Rothbard thought so. In his book, A Monetary History of the United States (page 91), Rothbard wrote that “[N]o movement in American politics has been as flagrantly misunderstood by historians as the Jacksonians,” thanks to all the misinformation about Jackson produced by the leftist, state-worshipping history profession. The Jacksonians were not “ignorant, anti-capitalist agrarians,” or “tools of the inflationary state banks,” as some historians have incorrectly portrayed him as being. “They were libertarians, plain and simple,” wrote Rothbard. (Note to libertarian purists: Murray Rothbard did not say that Jackson and his followers were as pure as the driven snow, like yourselves. They were imperfect human beings, as most of us are, but in the grand scheme of things, their main inspiration was really Jefferson, and they arguably comprised the most libertarian political movement in American history). Jackson’s populist movement “Favored free enterprise and free markets,” and “just as strongly opposed special subsidies and monopoly privileges conveyed by the government to businesses or any other group,” wrote Rothbard. “They favored absolutely minimal government” at the federal and state levels. This certainly seems consistent with at least some of President Trump’s words and actions, such as his call for tax cuts, for firing thousands of government bureaucrats and getting rid of many onerous and prosperity-killing regulations. This last statement sounds almost identical to the denunciation of the entire Washington establishment by President Trump as that very establishment sat next to him during his inaugural address. President Trump is not associated with such explicit views of central banking, but he does consistently condemn the corrupt enrichment of politically-collected elites that is financed by the Wall Street/Washington, D.C./Fed complex. And he is not worshipful of Janet Yellen and the Fed, as almost all other Washington politician are. Government spending fell from $30.9 million to $24.3 million during the four years of the Van Buren administration, in which he opposed the perennial mercantilist/Whig Party agenda of protectionist tariffs and corporate welfare spending on “internal improvements.” This would be another area of separation between President Trump and the Jacksonians. So far, the president had not imposed any protectionist tariffs, but has threatened to do so, even invoking the words of the quintessential protectionist promoter of crony capitalism in all of American history, Abe Lincoln. The second most anti-Jacksonian policy that has been embraced by President Trump is his proposal to spend untold billions on federally-funded “infrastructure.” Such “internal improvements” spending was opposed not only by the Jacksonians but also by all of their Jeffersonian predecessors. James Madison, on his last day as president, vetoed a bill that included “internal improvements” spending. Such spending was not authorized anywhere in the Constitution, said the Father of the Constitution. Pork-barrel corporate welfare spending was the original scheme concocted by Alexander Hamilton in his quest to explode governmental power far beyond what the Constitution allowed for (along with a central bank, a large public debt, and protectionist tariffs). Perhaps President Trump’s thinking about this is clouded by the fact that he is a lifelong New Yorker. Hamilton is to native New Yorkers what Lincoln is to natives of Illinois. Andrew Jackson also actually paid off the national debt, something that no other president has done since or probably ever will. President Trump, on the other hand, will probably not mention this fact in his discussions of Jackson in light of some of his grandiose spending proposals – for the military, the border wall, paid family leave, etc. All in all, a good case can be made that Donald Trump is a Jacksonian – for the most part. He is undoubtedly the one president who is most hated by the entrenched Washington political establishment since Jackson. That in itself establishes a strong intergenerational kinship between the two presidents.